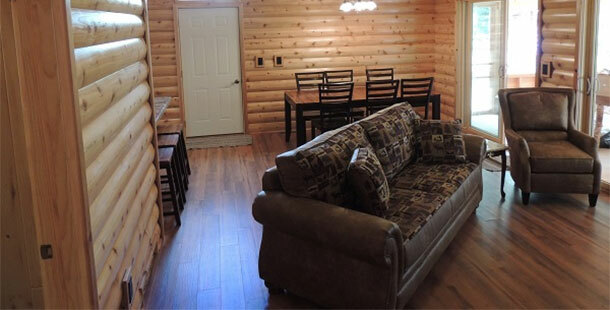 Allow Northland Lodge cabins to take you to a place where you can unwind and relax in a hand-hewn log cabin just steps from the shimmering waters of Lost Land Lake in the heart of beautiful Chequamegan National Forest. Enjoy the charm and character of our cedar log cabins. 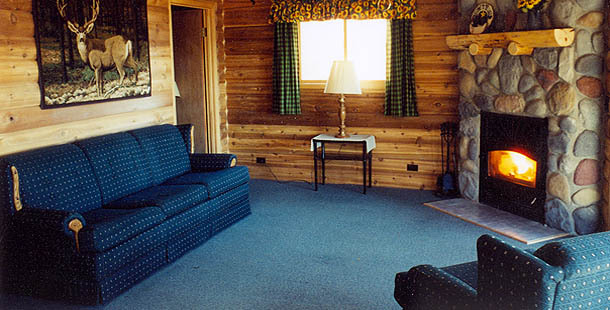 Each Northland Lodge cabin has its own homey and unique features. Whether set back and private or 6-20 feet from the water’s edge, enjoy the nostalgia of handcrafted country décor graced with grandma’s antiques. Some cabins have the added pleasure of fireplaces, cathedral ceilings and all have screened or enclosed porches. The easy access to water, land, or lodge fun facilitates creating life-long memories for the whole family in our playground shared with nature. Northland Lodge offers pet-friendly & comfortable lakeside lodging, a unique & traditional resort atmosphere with an abundance of recreational activities and enjoyment for everyone. Choose Northland Lodge as your annual north woods fun-filled vacation for you, your family and friends. We love to host generations of families or reunions, church groups, quilting and crafts groups and outdoor enthusiasts of all kinds. Golfers love our proximity to a number of courses. Hiking, biking, museums — lots of family-friendly activities both at the resort and nearby. DAILY AND WEEKLY RENTALS ARE ALLOWED DURING OUR QUIET SEASONS (May 1 to June 9 and August 18 to October 31). ONLY WEEKLY RENTALS ARE ALLOWED DURING OUR PRIME SEASON (June 9 to August 18). We are offering our quiet season discounts starting at 25% off our prime season rates! Call 715-462-3379 fore more information. Pet Policy: Pets must be kept on leash while outside, kept out of swimming area, off bedding & furniture, must be picked up after and never left alone in the cabin for extended periods of time. Cancellation Policy: Deposit is only refunded if we fill our cancellation – less a $50 handling fee and any expenses incurred. Guests will be charged for the number of nights reserved. Method of Payment: We accept traveler’s checks, cash or personal checks. We have an ATM machine that accepts credit and debit cards which require a PIN. For personal customer service & if you have any questions, please call us (715) 462-3379. © 2019 Northland Lodge Vacation Resort & Log Cabins, All Rights Reserved. | 715-462-3379 | Website Development and Design by CCS, Inc.